I love oyster crackers. Maybe it’s the salt? The crunch? The ridges? The memories? Despite days of unpacking (still) and rearranging (forever) and gardening, we’ve still had a few cool evenings and one such night last week, I made, for the first time, one of Dave’s favorite soups. Now we’ve been married thirty-seven years and why I haven’t made this soup before, I don’t know. If you’re from the midwest, fish or seafood soups weren’t terribly much part of the cooking pattern when I grew up. Fish? Yes. Fresh out of the thousands of lakes and in the summer. (Though my parents froze quite a bit for great winter fish fries.) But not fish soup. Seafood? A rarity. You ate it when you went south. Or east. Or west. Now that we have great fish and seafood available all of the time (especially in St. Paul, I’d add), we have such great options for seafood dishes and I’m finally able to set aside my occasional regional food prejudices and make clam chowder. 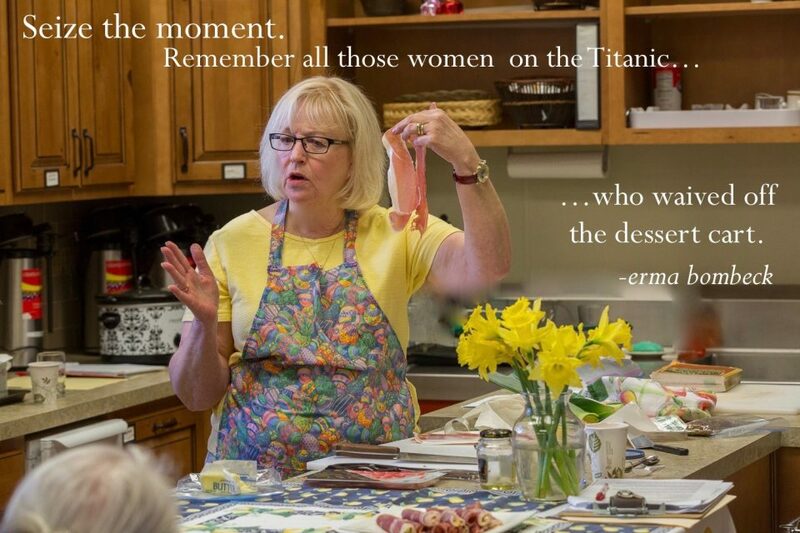 I did look at a few recipes and then did it my way. Naturally you can use fresh clams; I happened to have a couple of cans of clams in the pantry and used those. In fact, with the exception of the fresh peas (and you can use frozen), this dinner is pretty much out of everyday pantry ingredients. 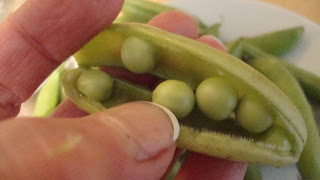 Fresh peas are around only in the late spring in the upper midwest, though Trader Joe’s seems to get them from ??? and often has some in their cold produce section many other times of the year. Note: This is a regular old unthickened chowder and that’s how I like it. 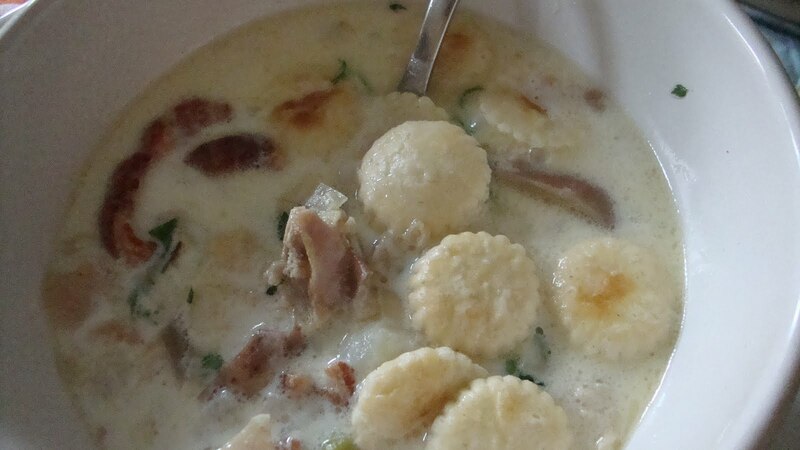 If you’d like thicker chowder, check out this site. Peas from late spring Farmer’s Market, St. Paul. Tender pods: eat them! 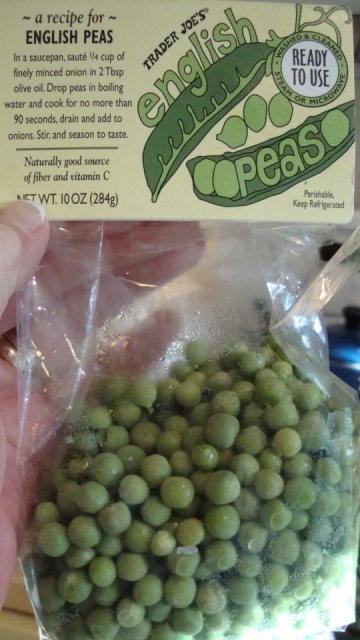 More available: Trader Joe’s fresh peas. Use quickly; they don’t keep long. In a 4 qt stock pot, cook bacon until well-browned and remove to toweling to drain. Chop the bacon and reserve. Saute onion, celery and carrot in the bacon fat until softened. Season well with salt and pepper. Add chopped potatoes and clam juice. Add enough water to cover all of the vegetables and bring to a boil. 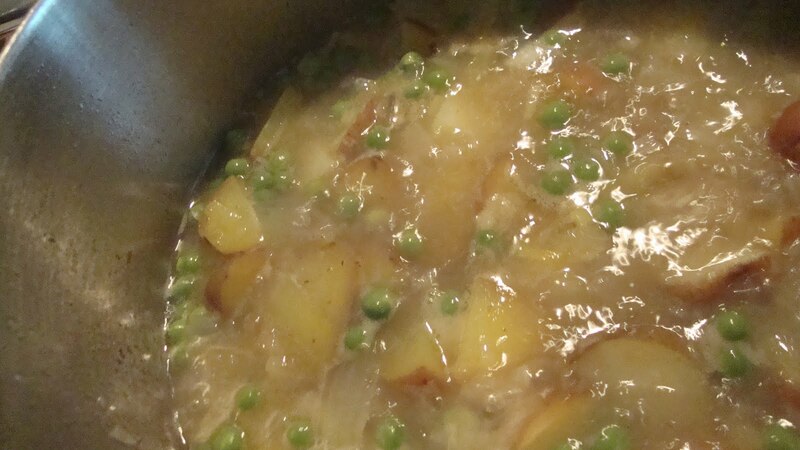 Reduce heat and simmer until potatoes are tender, about 10-15 minutes. 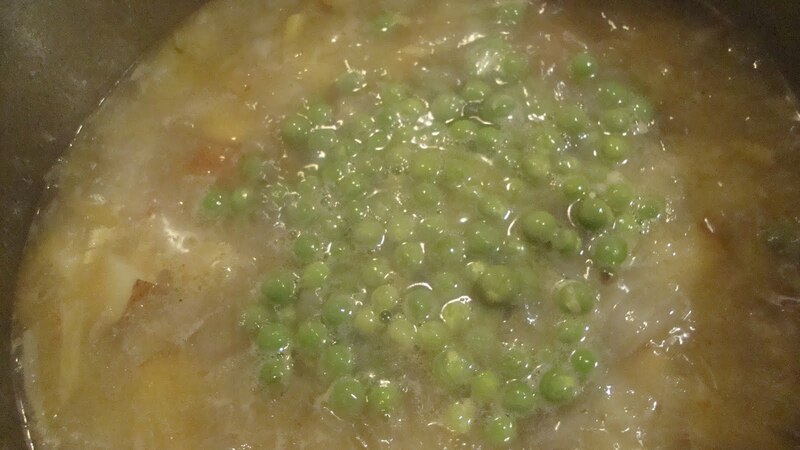 Add peas the last couple of minutes. Season with hot sauce. Add milk and half and half. Stir in drained clams and butter and heat through. Add fresh parsley and stir in bacon. Taste and adjust seasonings. Serve hot with oyster crackers or saltines and let folks add hot sauce as desired. Wine: Chardonnay is my favorite here, but even a nice Viognier or Albarino would work if that’s what you have. 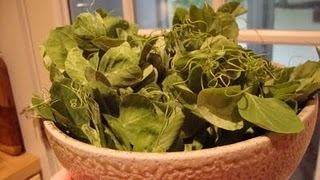 Pea shoots and trendrils from the May Farmer’s Market in St. Paul. I use these in salad or in Pasta Primavera. Happy New Year Alyce!I love clam shower but I've never added peas. That sounds like a good addition so I'm going to get a pot of chower on very soon! You're so lucky to get fresh peas. We love chowdah! I'd like to make it again now. Happy January! What a fantastic combination although most of your dishes are well put together with interest and flavor.I forgot but perhaps tomorrow, I will make something with peas and catch up. YUM YUM YUM! What a great addition to an already addictive dish.